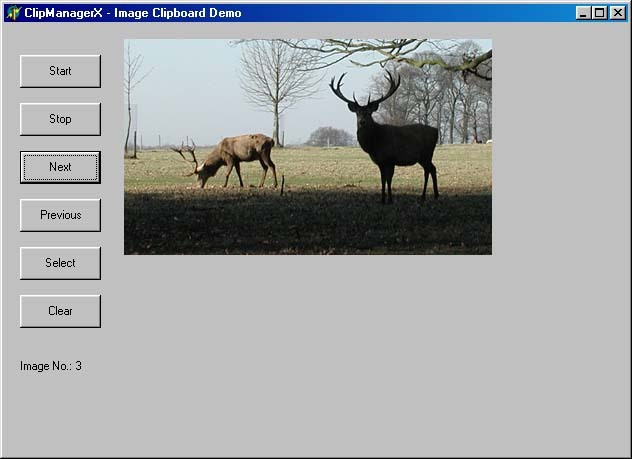 This example shows how to write a simple Delphi application that will collect images automatically as they are copied to the clipboard, then allow one of the images to be selected and copied back to the clipboard for pasting in another application. Install ClipManagerX, then extract the Delphi demo files from cmx_image_demo_delphi.zip. Open Delphi, and open the project CMX_Image_Demo.dpr. The "Start" & "Stop" buttons activate and deactivate the ClipManagerX control. "Next" & "Previous" step through the images that have been collected so far. "Select" copies the currently displayed image back to the clipboard, allowing it to then be pasted to another application. "Clear" deletes all the images from the control and clears the form.